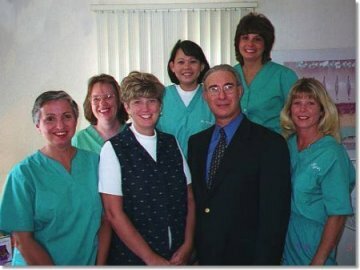 Dr. Packman and his staff are a team in every sense of the word. Many of them have been with him for many years which allows for a seamless working relationship and this experience ultimately benefits you. We regularly attend continuing education courses each year and techniques are brought back to the office and integrated for the benefit of our patients. Dr. Packman was born in London, England. He received his Dental Professional training at the Royal Dental Hospital School of Dentistry, at the University of London. Dr.Packman was awarded a Fulbright Scholarship in 1967 to attend Tufts University in Boston Massachusetts. He moved to the United States and did advanced specialty training in Periodontics at Tufts University School of Dental Medicine in Boston. He also obtained an American Dental Degree at Tufts. While at Tufts, Dr. Packman was an Assistant Professor of Periodontics. Dr. Packman opened his Bowie practice of Periodontics in 1973 and subsequently opened his office in Glen Burnie.. Dr. Packman was an Assistant Professor of Periodontics at Howard University and the University of Maryland Dental Schools. Dr. Packman is a member of the American Academy of Periodontology, the American Dental Association and the American Academy of Laser Dentistry. Dr. Packman attends many continuing education courses every year. He is married and has two grown daughters.